Includes refills. Specially formulated leads give a clear, fine line on fabrics. The lines are easily removed from most fabrics with the special Sewline Eraser (attached) or removed by dabbing with a damp cloth or washing. You will earn up to 99 reward points after purchasing this product. If you are registered on the site, you earn Loyalty Points with every Order. Barnyarns is Based in the United Kingdom and ships Worldwide. For a quick look at our UK shipping rates click below. The Barnyarns Club is free to join and allows you to collect Barnyarns Coins everytime you shop. Barnyarns Coins can then be used to pay for goods purchased on this website. To collect coins, you need to be a member of the Barnyarns Club. To join the Club, you need to register on the website. Once registered you will automatically collect Coins and you will not need to enter your address details over and over again everytime you shop with us! Spending Coins is Even Easier! ... as the coins from your previous order are automatically redeemed in your cart on your next order. The savings can be seen in your cart as you shop and you receive the maximum possible discount. If you want to save your points for a special purchase, not a problem, just adjust the number of applied reward points in checkout, before you pay. 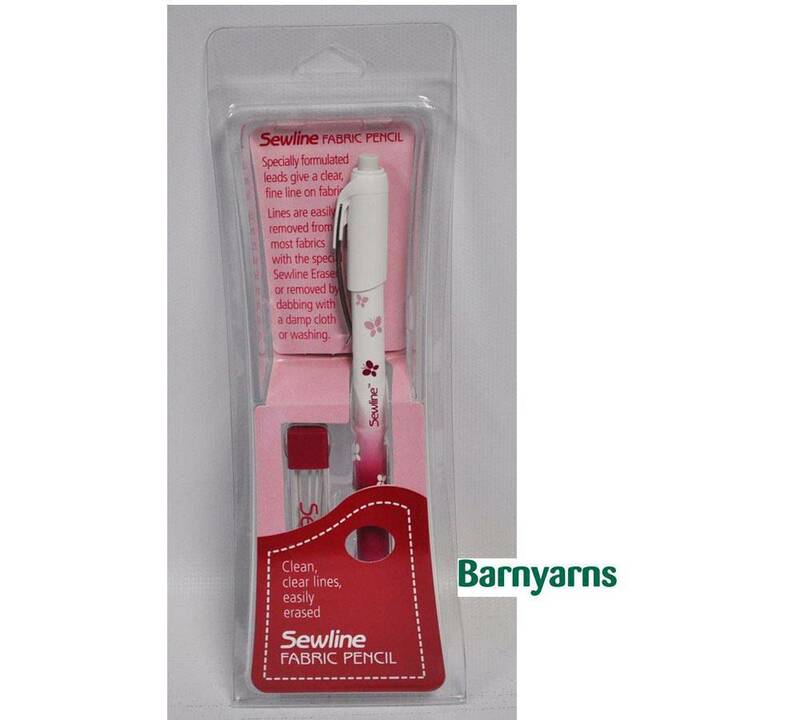 Sewline Fabric Pencil (White). Specially formulated leads give a clear, fine line on fabrics. The lines are easily removed from most fabrics with the special Sewline Eraser (attached) or removed by dabbing with a damp cloth or washing. Innovative ceramic technology creates a new generation of leads that are strong, non-gritty and more easily removed with the eraser or sponged off with a damp cloth. Sewline Fabric Pencils have a special cushioned point mechanism to protect the lead from breaking from writer pressure and give a clean, sharp line. Quick Look - UK Mainland Delivery Methods. Card payments are made directly with the bank through Sagepay. Barnyarns cannot see your card details or retain any card details. If you would like to return an item to us within 30 days of receipt, you are most welcome to do so. Before you send anything back, we do need to provide you with a returns number, so please contact customer care in the first instance. All returns require a Returns Number. We are unable to process a return for refund if we do not have a Returns Number. When you contact us, we will issue you with this number, which will allow us to track your return as it comes back into our offices and will ensure you receive our best possible response to your issue. Just so you know, all items to be returned must be returned in a saleable condition with the packaging intact and not ripped. Faulty items or incorrectly dispatched items will be replaced or refunded in full at our expense. If the received goods are unwanted, then we ask you to return them to us via the best possible postage method at your expense. The postage we paid to deliver the goods to you initially will not be refunded. When returning items it is best to use a signed for service, so you can assure yourself the returned goods have been received back to our offices. When returning items to us it is very important that you put a note inside the package advising us of your Returns Number, reason for return, name, address, order number and also a contact telephone number. We ask you to do this so we know who the return is from and we can contact you should this be necessary to ensure you receive the correct refund. Any refund will automatically be issued to the original payment method used when placing your order (i.e. card, PayPal account) and are processed within 5 business days of your parcel being received. Should you have any queries, please do call us, we are here to help.